A spicy food in traditional Korean cuisine, kimchi is no longer just a condiment or side dish to a Korean meal. This spicy fermented napa cabbage is now frequently included in salads, sandwiches, stir-fries and soups. Rich in vitamins A and C, the strong flavor of kimchi is distinctive and exotic and is now widely available at Asian grocery stores, health food stores and some high-end supermarkets. Here's some good news for those watching their calories: kimchi is a low-calorie, low-fat food. However, kimchi is rarely eaten on its own, so to keep the calorie and fat content low, choose low-fat dishes like stir-fries or soups to use your kimchi in. As a vegetable-based food, kimchi doesn't contain any protein per serving, and the amount of carbs in kimchi is relatively low amounts (same goes for sugars), but it does have three grams of dietary fiber per 100 grams. Colorado State University reports that the recommended intake of dietary fiber for adults is 14 grams per 1,000 calories. Based on a 2,000-calorie-per-day diet, 100 grams of kimchi will provide a little more than 7 percent of the daily recommended value of dietary fiber. It's no secret that yogurt is good for your gut, but you may not know that kimchi is also a source of probiotics, which are friendly bacteria that offer a number of health benefits. According to the Academy of Nutrition and Dietetics, including more foods like kimchi in your diet may help restore microbe balance in your gut, improve bowel function and give your immune system a boost. Probiotics may also be used to help manage symptoms caused by irritable bowel syndrome, or IBS, which is a chronic digestive condition that causes abdominal pain, gas, constipation or diarrhea. A 100-gram serving of kimchi has 18 percent of the daily value of vitamin A, based on a 2,000-calorie-per-day diet. As a natural antioxidant, vitamin A may reduce your risk of developing age-related macular degeneration and cancer, which can be caused by free radicals — produced as your body digests food. Vitamin A is also needed for healthy body development, including in embryos and fetuses, and it's vital for maintaining healthy vision. The daily recommended intake of vitamin A is between 700 and 900 for men and women over 14 years of age and between 1,200 and 1,300 micrograms for women who are nursing. A 100-gram serving of kimchi has 18 percent of the daily value of vitamin C. Like vitamin A, vitamin C is also a natural antioxidant, protecting your body's cells from damage from free radicals. Vitamin C aids in the production of numerous proteins, especially collagen, which keeps your skin elastic, and helps your body produce and maintain your ligaments, tendons and blood vessels. It's also essential for repairing wounds. The adequate intake of vitamin C for adults is between 75 and 90 milligrams per day (80 to 120 if you're pregnant or breastfeeding). If you smoke or are exposed to secondhand smoke, MedlinePlus recommends that you increase your daily intake by 35 milligrams. On the flip side, because of the way kimchi is made, it's high in sodium, providing 670 milligrams of sodium per 100-gram serving. A diet that is high in sodium increases your chances of developing high blood pressure. According to Colorado State University, the majority of American adults consume excess amounts of sodium in their diet. The daily upper limit recommendation is 2,300 milligrams of sodium, as per guidelines from the Centers for Disease Control and Prevention. For African-Americans, adults over the age of 51 and those with a history of heart disease, the daily upper limit falls to 1,500 milligrams. 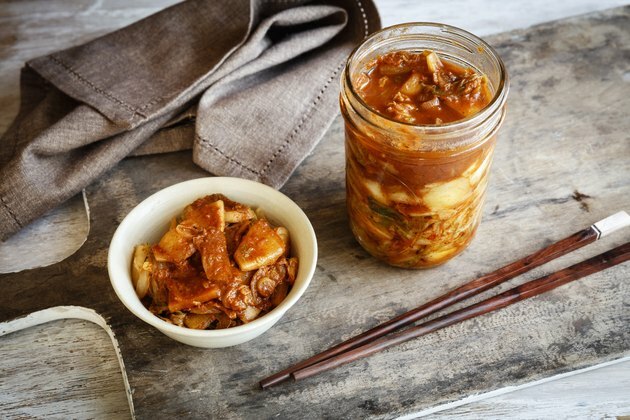 A single serving of kimchi provides between 29 percent and 45 percent of the recommended daily limit of sodium. Which Yogurts Have Lots of Digestive Enzymes?